Dogan Ibrahim's approach is firmly based in practical applications and project work, making this a toolkit rather than a programming guide. No previous experience with microcontrollers is assumed - the PIC family of microcontrollers, and in particular the popular reprogrammable 16X84 device, are introduced from scratch. The BASIC language, as used by the most popular PIC compilers, is also introduced from square one, with a simple code used to illustrate each of the most commonly used instructions. The practicalities of programming and the scope of using a PIC are then explored through 22 wide ranging electronics projects. 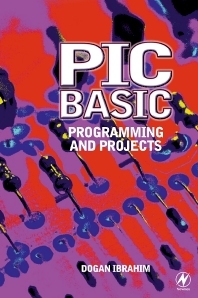 The simplest quickest way to get up and running with microcontrollers Makes the PIC accessible to students and enthusiasts Project work is at the heart of the book - this is not a BASIC primer. Electronics hobbyists, FE and schools electronics, electronic engineering undergraduates, technician engineers, electronic design professionals. Prof Dogan Ibrahim graduated from the University of Salford with First Class Honours in Electronic Engineering. He then completed an MSc course in Automatic Control Engineering at the University of Manchester, and PhD in Digital Signal Processing at the City University in London. Prof Ibrahim worked at several companies before returning to the academic life. He is currently a lecturer at the Department of Computer Information Systems at the Near East University. Prof Ibrahim is a Fellow of the IET, and a Chartered Electrical Engineer. His interests are in the fields of microcontroller based automatic control, digital signal processing, and computer aided design.Dogan Ibrahim has been Associate Professor and Head of Department at the Near East University, Cyprus, lecturer at South Bank University, London, Principal Research Engineer at GEC Hirst Research Centre, and is now a hardware and software systems consultant to London's Traffic Control Systems Unit.